Technology is advancing at a super-fast pace and giants such as Google and Microsoft are always competing with each other to provide the best, most future-first products to their customers. While the customer benefits from this race, there is also confusion! Take Microsoft wireless display adapter vs Chromecast for example. They both serve the same purpose. How do you choose which one to buy? Do you just pick one based on the brand you are comfortable with it? No. It is crucial that you measure the pros and cons of each before you decide. We’ve listed down the difference between the two sticks so that you make an easier choice. Tech savvy people and those who want optimal performance will definitely want to know the kind of technology used and whether it can be used conveniently. Microsoft wireless display adapter uses Miracast technology while Chromecast uses proprietary technology. This means that there are limitations when it comes to compatibility with Chromecast. Any app that you want to stream from needs to be compatible specifically with their proprietary technology. This is a hindrance for many. Miracast technology, on the other hand, is extremely popular. Most tablets and apps support it seamlessly. iOS users may not really like Microsoft wireless display adapter because right now, there are no popular apps that support it. Android fans can rejoice. Of course, even Chromecast mostly supports Android applications, but it streams a few apps that are opened in the Chrome Browser. You can stream Netflix, HBO Go, etc. from your iPad or iPhone without issues. You will find it pretty interesting and strange at the same time that Microsoft wireless display adapter does not work with any operating system prior to Windows 8.1. Chromecast is much better in this regard. It works with all versions of Windows. The Microsoft wireless display adapter connects directly with the source without the need of a Wi-Fi router thanks to Wi-Fi Direct. With Chromecast, it is not the case at all. The Chromecast is cheaper than the Microsoft wireless display adapter. We are positive that Microsoft came up with its wireless display adapter to make it easier for us to stream presentations and images. Chromecast, on the other hand, was for entertainment and relaxation. It is honestly unfair for us to compare both based on specific terms because their usage is so different. What’s the final word then? This totally depends on the type of devices you own and your purpose. Do you own a Surface Pro? Microsoft wireless display adapter is the way to go. Do you use iOS? You should buy the Chromecast. Do you want to stream movies? Buy the Chromecast. Do you want to run presentations? Buy the Microsoft wireless display adapter! 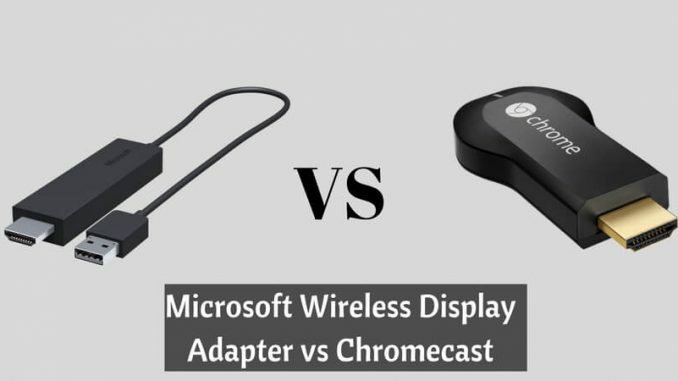 So, we really can’t pick a winner in Microsoft wireless display adapter vs Chromecast. The right one for you solely depends on your preferences and usage choices. Which one are you going to buy and why?